Yesterday I received an odd email for one of my Google App Engine projects, Guru JSON-RPC Tester, informing me that I do not have a billing account and that if I do no create one that my project will be deleted. This confused me a bit since I did not use any of the Cloud Platform services, never signed up for the Cloud Platform trial and only ever used the free Google App Engine hosting. has/have been in the billing disabled state for more than 30 days. 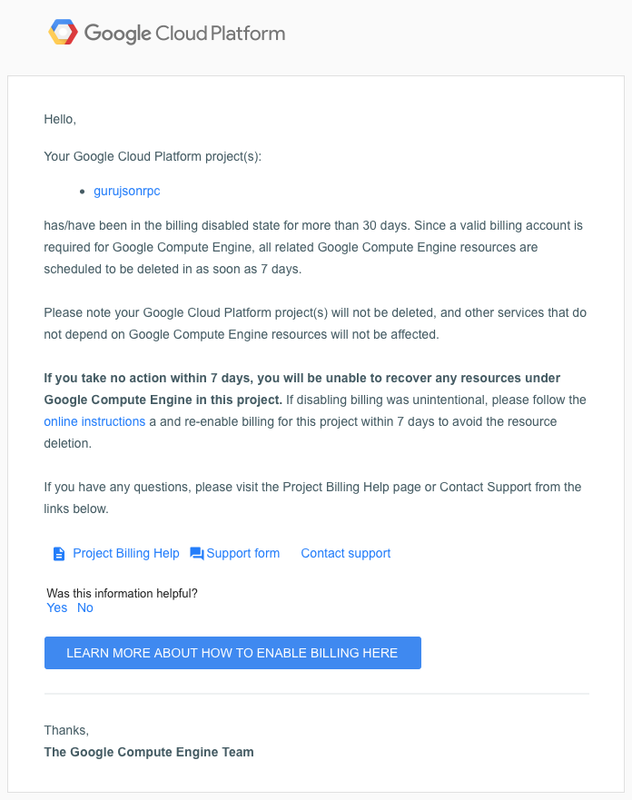 Since a valid billing account is required for Google Compute Engine, all related Google Compute Engine resources are scheduled to be deleted in as soon as 7 days. Please note your Google Cloud Platform project(s) will not be deleted, and other services that do not depend on Google Compute Engine resources will not be affected. If you take no action within 7 days, you will be unable to recover any resources under Google Compute Engine in this project. If disabling billing was unintentional, please follow the online instructions a and re-enable billing for this project within 7 days to avoid the resource deletion. If you have any questions, please visit the Project Billing Help page or Contact Support from the links below. At first I thought that maybe it's a hoax or a phishing email, but it checked out as legit. Eventually I decided to hit that 'No' link for the 'Was this information helpful?' part, which took me a feedback form. I've explained my situation in the form and hit submit, more out of frustration than expecting an answer. The email quoted below was sent to some Google Cloud Platform customers in error. If you do not use Google Compute Engine, you can safely ignore that message. We apologize for any confusion this has caused. We received feedback from many customers who do not use the Google Compute Engine service (for example, they only use Google App Engine). Your Google App Engine apps will continue to operate normally, and you do not need to take any action at this time. So I didn't have to do anything about billing after all, I really didn't like the idea of Google having my credit card details essentially 'just to prove that I am human' as per the FAQ. This also means that Guru JSON-RPC Tester can keep running the way it has been! If you've got a similar email it would be worth contact Google about it just to make sure you also don't have to take any action.